Cordyline Australis ‘Torbay Dazzler’ is a palm-like sub-tropical tree with upright growing habit. 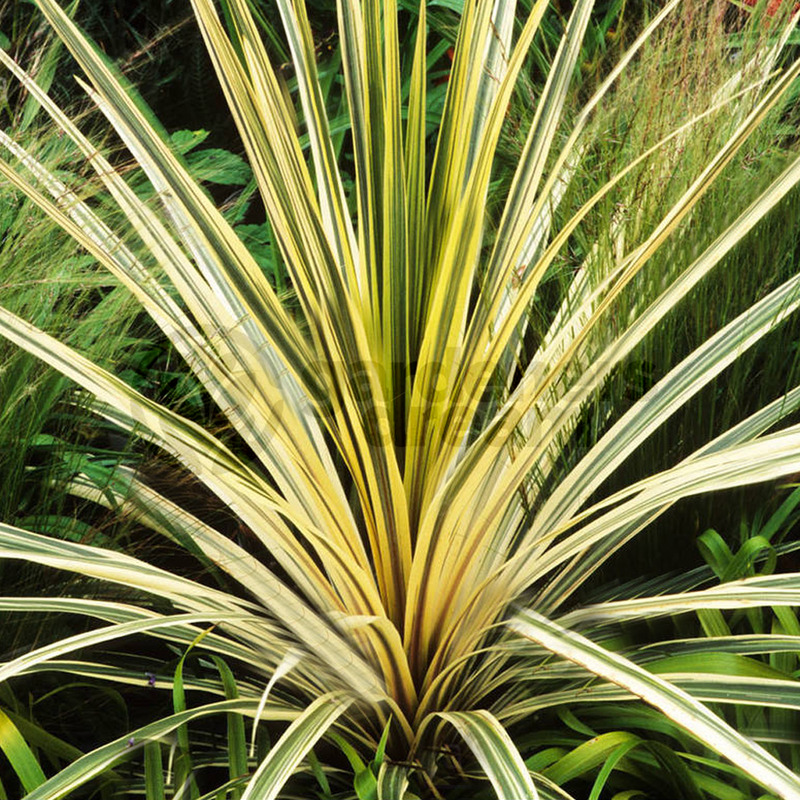 It is a more compact Cordyline variety that produces several heads of long leaves as it ages. It is an excellent architectural plant that forms an upright clump of sword-shaped arching leaves. Torbay Dazzler literally produces bright and dazzling foliage that adds ornamental value to this palm. Originating from New Zealand, this tough palm will mature into a small tree when planted in the ground. Only the mature Cordyline Torbay Dazzler will produce fragrant white flowers that attract bees in spring. It features stunning long and narrow, sword-shaped leaves stripped in green and white. The new leaves will display a hint of pink in the midline. These arching leaves give this palm its architectural style and makes it suitable for decorating the pool side areas. These are coastal plants that can tolerate sun but prefer shade in hotter inland gardens. Plant them in any soil that is well-drained and the younger plants will specifically need moist soil. These are drought resistant trees that can withstand dry conditions but only for a brief period. Once established, Torbay Dazzler grows much hardy and sturdy. Adding a layer of organic mulch to its base will ensure moisture retention but avoid clogging of water near its roots in winter. Pruning is not necessary, simply cut any damaged leaves that have turned brown. Torbay Dazzler is an exotic plant giving sub-tropical effect in your garden. It is suitable for container gardening but needs protection from strong winds. It is perfect for lighting up dull corners in a garden, where its bright foliage contrasts beautifully with darker backgrounds. A tough plant that tolerates drought and salty coastal winds.